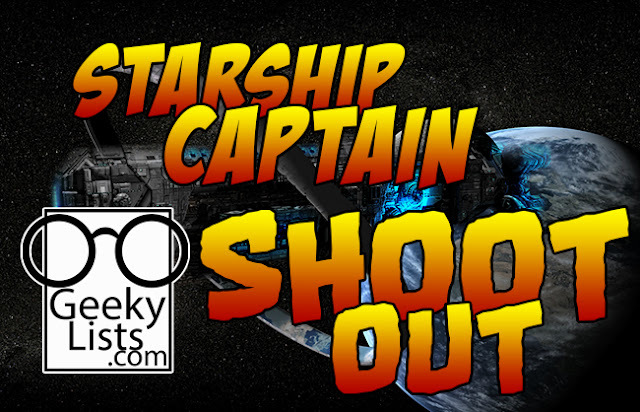 Which Captain truly rules space? 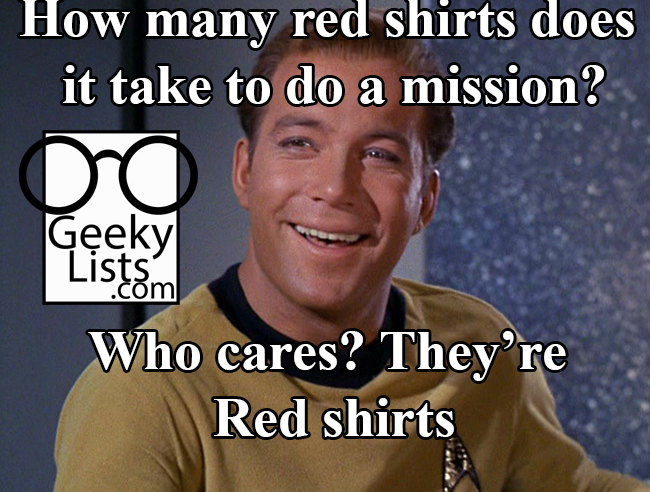 We at Geeky Lists set to the stars to find out. 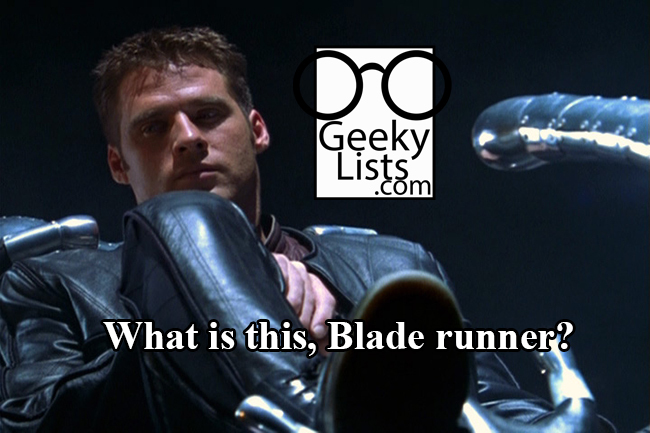 After talking about Sci Fi movies in general and then discussing the best new SciFi shows we started arguing over who was best at the helm, so a new list was born. 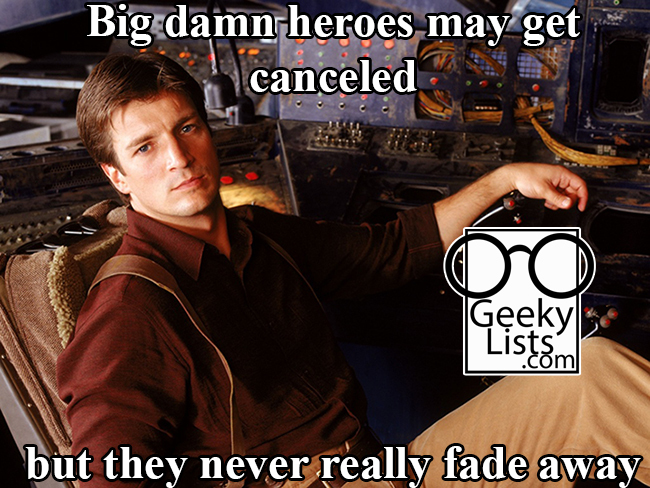 Lone pilots and ships that with a crew under 5 had to be ruled out, for the sake of shortening the list. Some general guidelines were used but the justification is on a case by case basis. As usual the list is in no particular order, you either made the list or you didn't. So open hailing frequencies, because the list is being sent to you now. 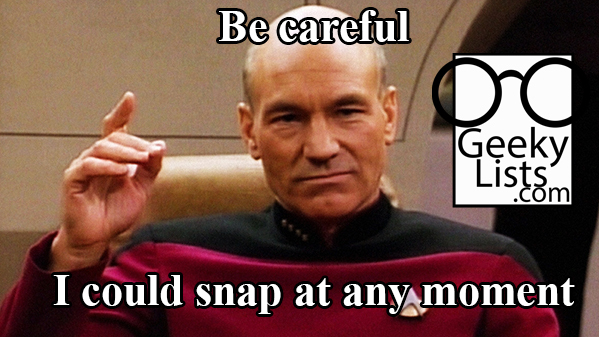 Captain Picard is the embodiment of a refined, educated, and wise captain. Tending to pull from experience and guile, he more often than not out maneuvered opponents rather than using brute force or raw courage. Having to deal with omnipotent and and omnipresent enemies, he could still be seen sipping tea, planning, and winning ground using Shakespeare. Not to say he never uses weapons, but he was a complex captain, that struggled and worried about his entire crew and space politics at large. Probably the most level headed of the list, and also the wisest, he lead with grace drawn from competence, with a good dose of toughness. Captain Picard is definitely one of the best Space Ship captains. Prime directives are over rated. Captain James T Kirk aboard the star ship Enterprise was an iconic hero. Being decisive, brave, and clever, if he didn't like his options, he MADE an option. He cut the cloth for the dashing saviors that came after him with a metric ton of style. Alien chick that looks good, he kissed her, big nasty alien charging, he fought it, group of people on the verge of being destroyed, he saved them. He might have been rash and a force of nature unleashed on the universe, but he was a doer, and he got the job done, always. Captain Picard may have been the surgical scalpel later, but never under estimate the usefulness of the hammer that was Captain Kirk. The scruffy nerf herder himself, Armed with one of the baddest co-pilots in the universe, he succesfully adapted from being one of the best smuggler pilots into evading the entire empire. Sheer piloting skills and backing up his crew the entire way. You want to talk about decisive bravery? The doors open in Sky City, Lord Darth Vader is standing there, about to spring the trap. Han doesn't say anything, he doesn't pause or make a shocked face, he shoots, multiple times, right at Vaders face. If Darth Vader would have paused for even a moment, he single handedly would have ended the war, using nothing but his standard blaster and raw courage. Also he NEEDS to get points for all the quotable lines. 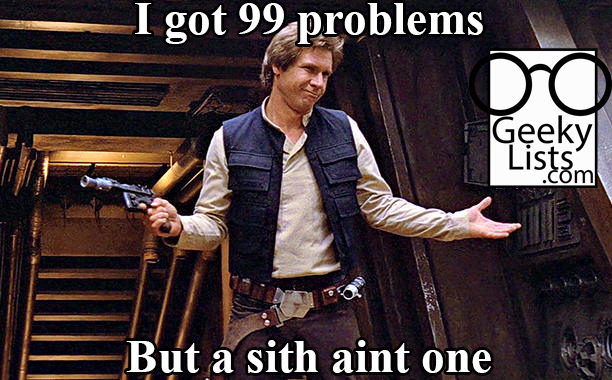 Plus, he can do the Kessel run in under 12 parsecs. Did someone mention quotable lines? Cause this big damn hero is full of them. Few captains love their ship and their crew as much as Captain Mal. I am not sure I would go with cunning so much as devious, but Captain Mal will find a way in the face of overwhelming odds. He inspires a loyalty from his crew that most captains could only dream of, doubling back for crew members he doesn't even like without a second thought. Never one to hesitate when things get heavy, he is very capable in a fight. He acts dark but almost always redeems himself, as far as complex and likable Captains go, Captain Mal would be the yang to Captain Picards yin. 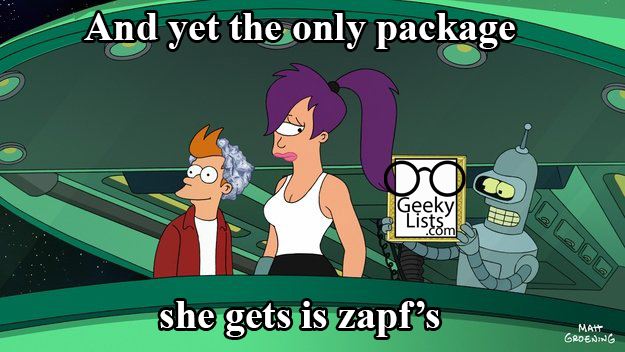 Poor Leela, she has shown great skill in flying, hand to hand combat, and always gets the package where it needs to go, despite the certain doom involved. The reason she makes the list is because she continues to function and get the job done while faced with a crew that is an army of ignorance. They subvert her at every turn and yet somehow she manages to rally them all together to make it back safely. Leela is the ultimate cat herder as well as overcoming the stigma of being a mutant, and for that, she deserves her spot on the list. While his only real training was playing a Captain on TV before becoming a real captain. Captain Nesmith managed to figure out the ropes in record time. His crew was only subversive for a small moment in the beginning and formed into a team under him the second real trouble started. Even with a lack of any actual experience he managed to score major tactical victories and ultimately save an entire race of aliens. Fake it until you make it? Never give up, never surrender. 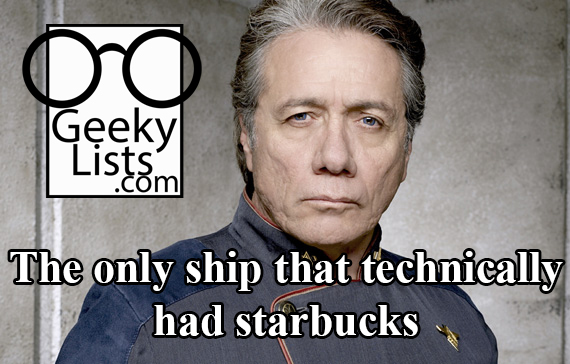 Few Captains have had it harder than Admiral Adama, most people would just break down and let humanity die out. He is hard as nails, as long as everyone did as he said, things generally continued. He had the grit to put down a mutiny, and make the hard calls for survival as a whole. Faced with an impossible situation, he took it one step at a time and worked through it. A second generation astronaut, thrown through a worm hole and trapped on a ship full of rebels sounds like something you would have to fight your way out of. Instead Crichton took over, with his decisive leadership he managed to bail the crew out multiple times. Forever spouting references the crew will never get, and trying to figure out the best move to get home and keep everyone safe. Strongly principled and full of raw conviction, he put himself in danger and was prepared to sacrifice himself for what he believed was right, even to the point of giving up his happy life on earth, which he spent most of the time returning to. Always looking on the bright side of things, he was easy to underestimate but he demonstrated knowledge in theoretical physics that was beyond a lot of space fairing advanced scientists. He ended up in love with aeryn, and got the girl, he wanted to get to earth, and got there. 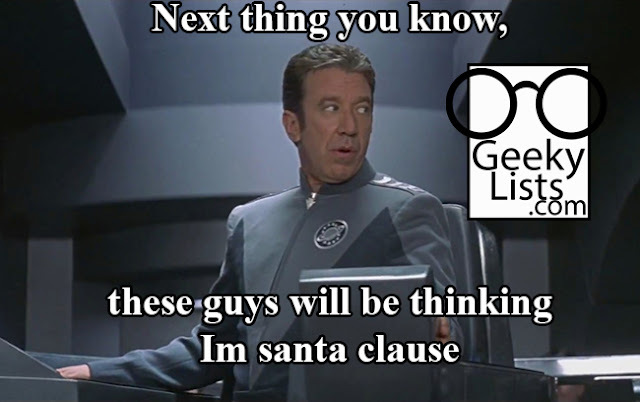 He was highly effective and did everything in an upbeat way, for that, he makes the list. 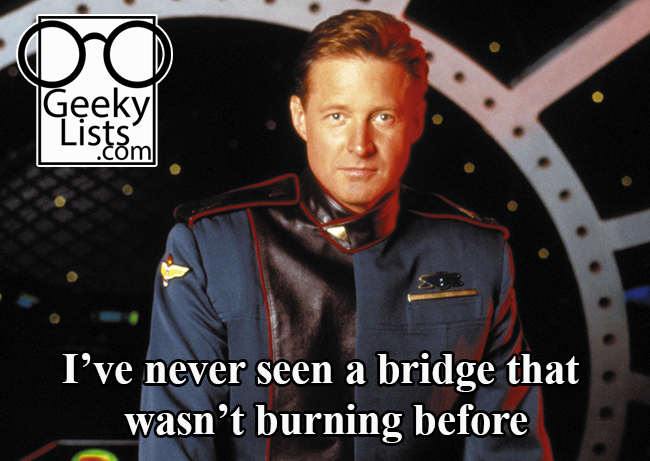 The only Captain to destroy a Minbari ship, A few other sites disqualified him as being a station captain, but not only did he command the Lexington and destroy the Minbari flagship Black Star but he also assumed the rank of commander on the White Star 1, a ship with a crew of 50, so he counts, twice, I don't think some of these other guys have even seen the shows. Sheridan was more rigid than his predecessor on Babylon 5, but he showed a competence and a head for politics that brought the others under him in short order. He cared deeply about everyone in his command, and tried to make the choices he thought was right, defying everything if necessary when reaching for the greater good. His guile is not to be underestimated either, as more than a few people, including the unbeatable Minbari, have been out maneuvered by him. He protected Earth and tried to protect even when Earth itself turned on him, and when super powered ancient races came for him, he mounted an army, did all he could to even the odds, and brought it right back to them. John Sheridan deserves his spot on this list. We couldn't land a meme on him. If you need someone who really knows where their towel is, look no further than the president of the galaxy. The two headed, Three armed, inventor of the Pan Galactic Gargle Blaster may not seem like an obvious choice, but he DID evade the entire universe, and successfully complete his mission. He has survived many encounters, including machines designed to kill him such as the Total Perspective Vortex. Given his formidable skill set, guile, and just plain luck, he managed to steal a spot on the list as well. 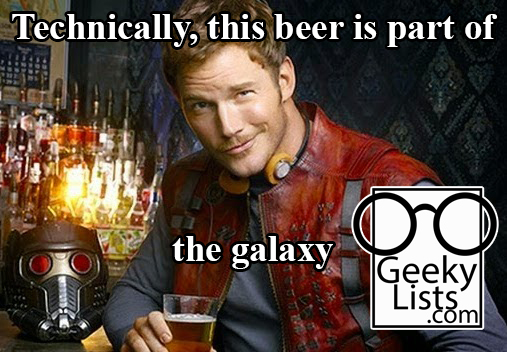 With guardians of the galaxy in movie form, we can include Star Lord, and on sheer awesome alone I think he qualifies. The former mercenary started early and bounced around the galaxy from adventure to adventure. With an addiction to classic rock and more bravado than any normal man should have, he found himself in between two galactic super powers, and committed to fighting it out. 5 separate people show up to kill him, and 5 separate people end up on his crew. He is ever crafty, fast with a blaster, and down to try literally anything if it means saving the galaxy. As always, Thank you for reading, Please remember to share the post if you enjoy it, and to follow us on social media, you can find the icons on the top right of the page.